President Barack Obama's ambitious new strategy to combat climate change has won big praise from NASA, with the head of the U.S. space agency pledging a steadfast commitment to tracking the health of planet Earth. 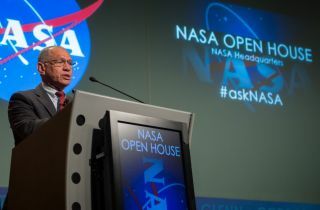 "Having looked back at Earth from outer space, I have seen just how fragile our home planet is — and I'm committed to doing everything I can to help protect it," NASA chief Charles Bolden, a former space shuttle commander, wrote in a NASA blog post Wednesday (June 26). NASA's satellite fleet may be among Earth's best witnesses to the effects of climate change. Bolden highlighted some of the 17 missions in NASA's Earth Science program that are currently monitoring the Earth's atmosphere, oceans, weather and climate from a remote perch in space to study and predict changes over time, as well as those due to global warming. The Landsat satellite series, for example, has provided high resolution images of the planet's surface for the past 40 years and have helped establish a baseline of understanding the Earth's changes, Bolden wrote. He also mentioned the $1.5 billion Earth-observing satellite Suomi/NPP spacecraft, which launched in 2011 and is collecting data for short-term weather forecasts and long-term climate models. "The data we collect helps us understand our planet as a dynamic, unified system," Bolden said. "It helps us predict natural and manmade disasters such as hurricanes and wildfires and recover from them. Our satellites will play a critical role in helping us assess the carbon emissions problem, its history, current status, and possible future so decision makers can make informed policy decisions." Bolden also wrote that Obama's 2014 budget request for NASA would support seven new Earth Science missions set to launch through 2020, including the Orbiting Carbon Observatory-2 (OCO-2). He said all of NASA's work in exploration "has benefits here on Earth, by helping us understand and protect our natural resources, improve lives, and strengthen the economy. The President's climate initiative provides one more opportunity for our missions in space to bring science and technology home to the American people in a meaningful way." Follow SPACE.com on Twitter @Spacedotcom. We're also on Facebook and Google+. Original article at SPACE.com.